The author of this letter apologized for the lack of fancy stationary. And was worried about spelling errors. When I brought the post into the house this afternoon, I was delighted to discover an envelope that could have come from one of my memory boxes. Written in longhand. With highlighter doodles on the envelope. Simple paper. Filled with tangential lines of the author’s stream of consciousness. A glimpse into her life. And — a newspaper clipping too!! Reminded me of the countless letters I’d written (and received) in high school, college, stateside, & abroad. Took me back to an earlier time. An easier time. When communication wasn’t instantaneous. And letters were opened, unfolded, read, refolded. Only to be unfolded and read again. JaneTheWriter — you made my day. P.S. You have such lovely penmanship. Jane the Writer is truly a Writer–in both senses of the word. Added bonus–she’s a lovely person! Thanks to both of you for such kind words! It’s nice to see people still writing letters. 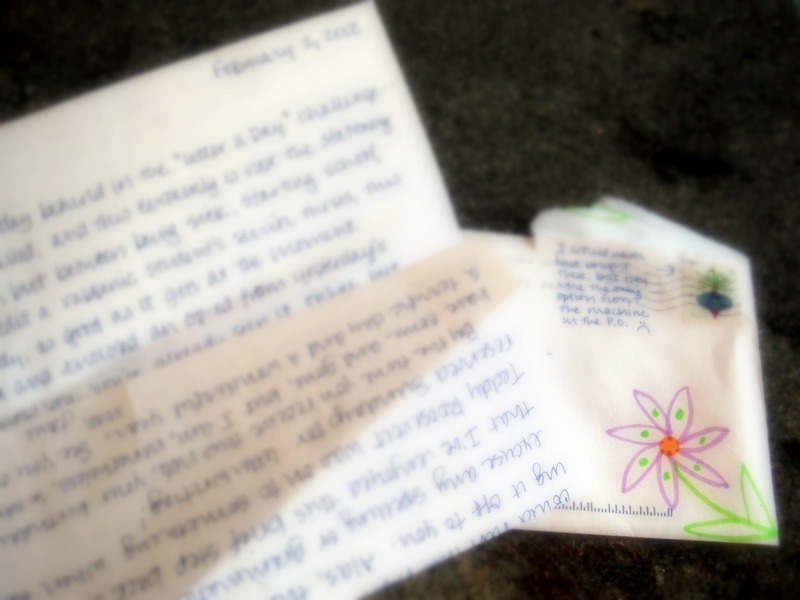 I am a huge fan of the handwritten letter.